My love letter to my daughter’s lunchbox. So. I am an Environmental Management major with a minor in Natural Science. I have really been inspired to try and eliminate as much trash as possible in our household. As of right now we throw away one bag of trash about every 7-10 days for our family of four. It’s not bad (at least compared to the average American) but I know we can do better. 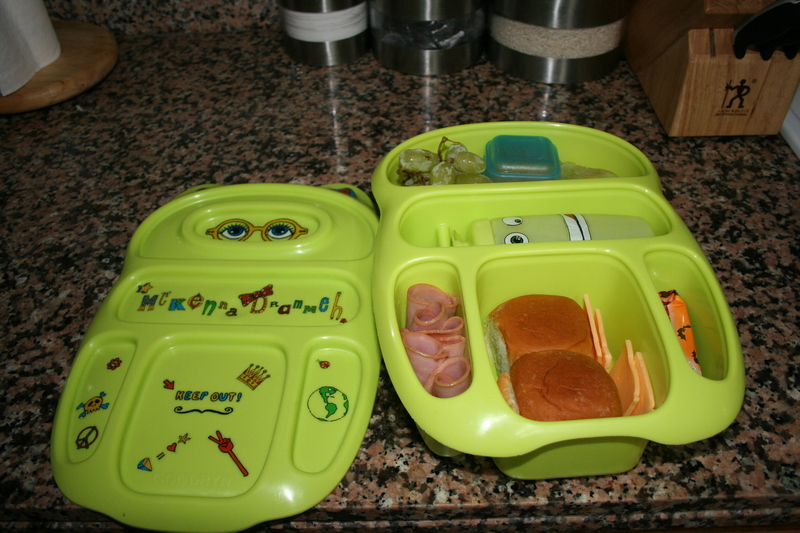 This year when I was shopping for lunchboxes for my daughter I wanted to try to have her have as little trash as possible at school. After searching for ages I finally found THE ONE. I love this lunchbox so very much. It has 5 different compartments separated from each other and there is no need to have anything packed in plastic bags. Hawaii rolls and meat and cheese... and a dang granola bar, gotta get on making some of those! This one is not the best example, I have a granola bar and a piece of leftover valentine candy in there. Homemade granola bars are on my to do list! Fruit leather too, fruit snacks are the other thing killing me! Those plastic film packages aren’t recyclable! Better… I did wrap the sandwich in a piece of parchment this day. The square compartment fits a regular sandwich cut into halves perfectly. My daughter just prefers the hard Spanish bread for her sandwich. It’s also nice that she packs a LOT more fruit and vegetables. The middle spot holds a drink container but she prefers to just drink water at lunch. 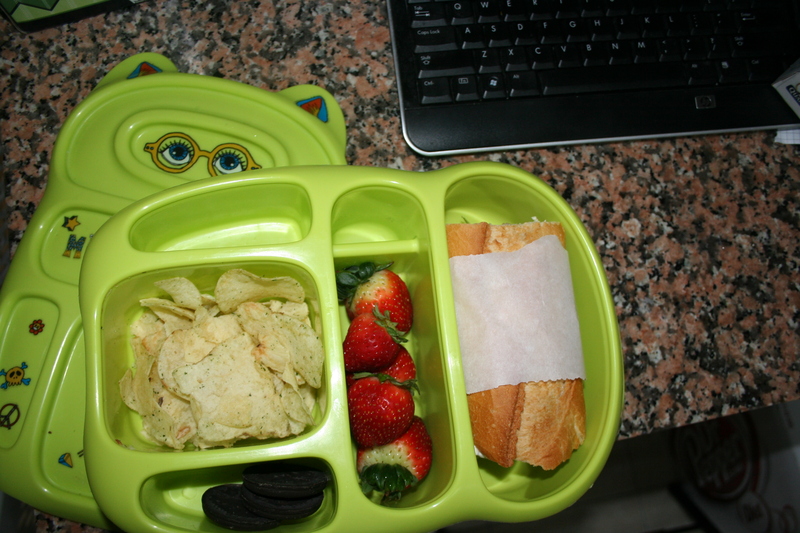 Her favorite part is the stickers that it comes with to customize your lunch box…. The only downside is the fact that the original size (which this one is) is pretty big and does take up a lot of space in her backpack. Also its up to me to remember to wash it or at least wipe it out every day! 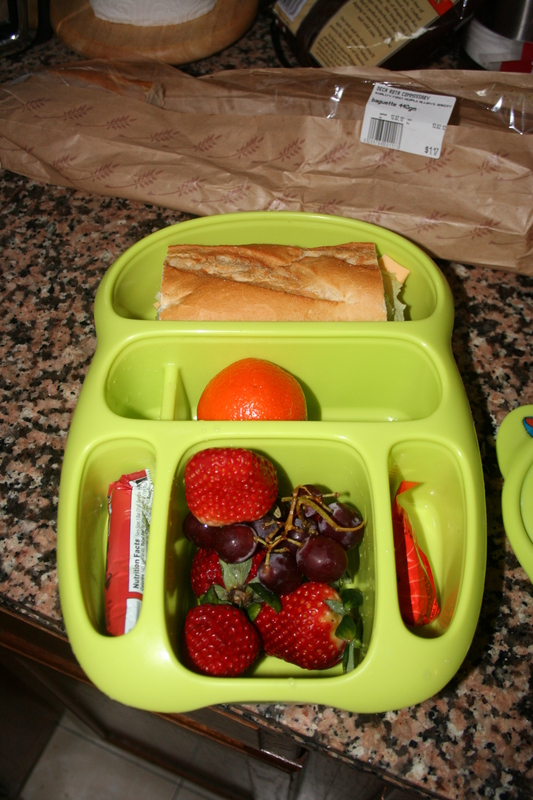 So while it isn’t necessary for you to go out and buy THIS lunchbox, try NOT using plastic bags for your lunch! There are SO many cute reusable products out there, get to it! You should try making homemade LARA Bars. They are so good, healthy and super easy to make! You can also freeze them for up to two weeks. I posted on it a few weeks ago and also listed the link that I found them but you can just google homemade LARA Bars. I have everyone in my family addicted. We don’t even bother freezing them because they don’t last long enough. Oh that sounds awesome, I am ADDICTED to Lara bars (especially peanut butter cookie!) Thanks for the heads up!